The Rode Blimp 2 is a professional wind shield and microphone support system. 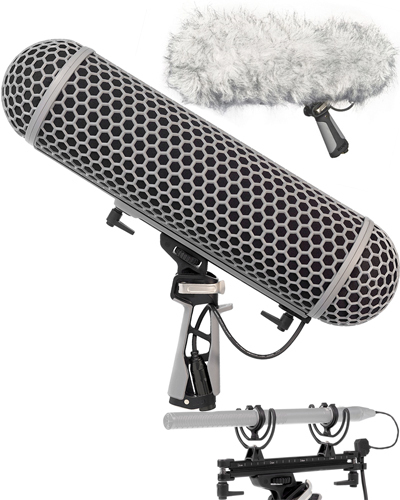 It is designed for shotgun microphones up to 325mm (12 ¾”) long. You can add the Rode Universal Blimp mount to reduce the weight when using it on a boom pole. The Blimp can be used in two configurations, either with of without the dead wombat furry cover. The blimp along can provide up to 14db of wind noise attenuation. With the dead wombat cover this increases to 22db. The blimp consists of the main blimp body, 2x blimp end caps, handle/mic mount and the dead wombat cover. You can replace the handle grip with the Rode Universal Blimp mount to reduce the weight again when using it on a boom pole. If you are shooting indoors you can remove the blimp housing and use it as a mic shock mount to reduce weight. The microphone mount features Rycote Lyre shock mounts, for the ultimate in microphone stability and handling noise reduction. The kit also comes with a short XLR cable which runs through the Shock mount housing to an external cable. The pistol grip has a built in XLR grip which can hold cable connectors securely to minimise cable strain.